Liberty-Eylau junior Ben Witterstaetter is the ESPN Texarkana/Dewey Moore Ford Player of the Week. Arkansas High sophomore Graydon Martin is playing like a veteran for the Razorbacks’ baseball team in 2019. Martin hammered five hits in Arkansas High’s wins over Benton and Lake Hamilton this past week, and has been named the Fox Sports Texarkana/Dewey Moore Ford Player of the Week. Martin raised his season batting average to .439 with three hits last Monday against Benton, and contributed two hits in the Hogs’ 8-2 win over Lake Hamilton on Friday. 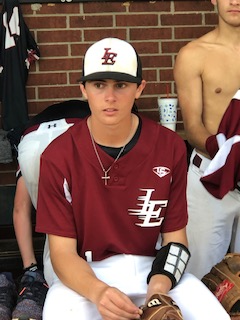 Liberty-Eylau junior Ben Witterstaetter rose to the occasion Friday to keep Liberty-Eylau’s playoff hopes alive. The ESPN Texarkana/Dewey Moore Ford Player of the week is Witterstaetter, who silenced North Lamar’s bats Friday, while pitching the Leopards to a 10-4 victory. Witterstaetter threw seven innings, walking two and striking out seven to earn a win over the Panthers. Atlanta continues to steam-roll over its opposition in district, and one big reason is the play of Jake Thompson. Thompson hurled a two-hitter in the Rabbs’ 15-1 win over Paul Pewitt. Earlier in the week he had a home run and single in Atlanta’s 19-4 victory at New Boston. Those two performances have earned Thompson the KPYN/Dewey Moore Ford Player of the Week.